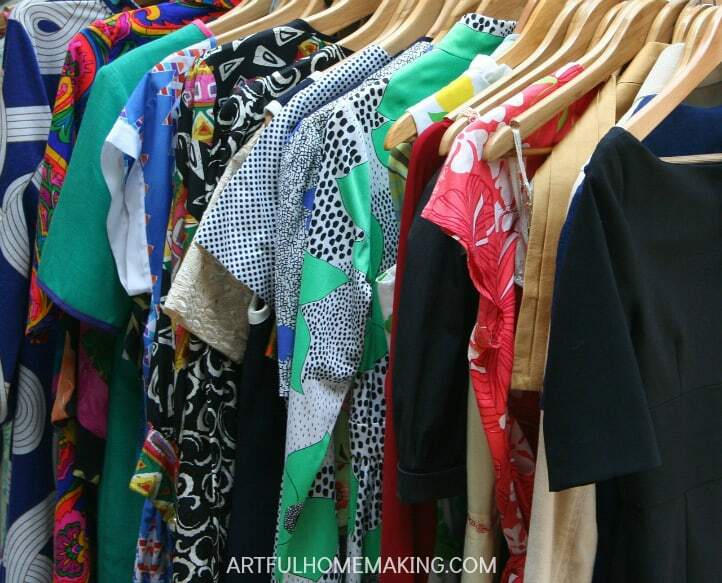 After reading The Life-Changing Magic of Tidying Up, I started going through my clothes. 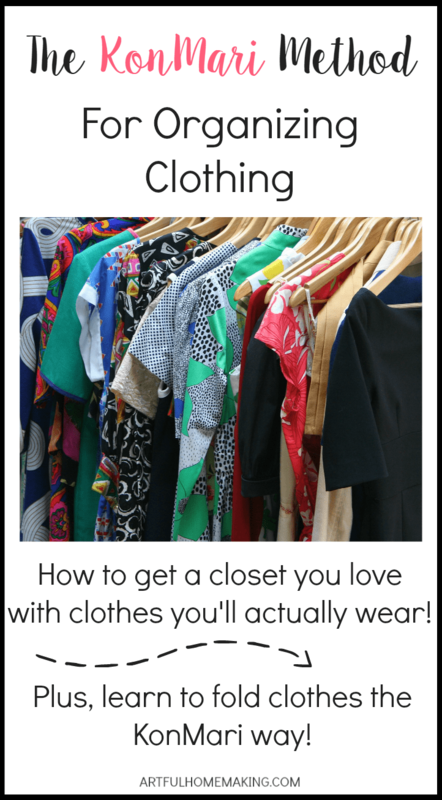 I knew I had a lot of clothing that didn’t pass the “joy test,” and I was excited about revamping my closet. 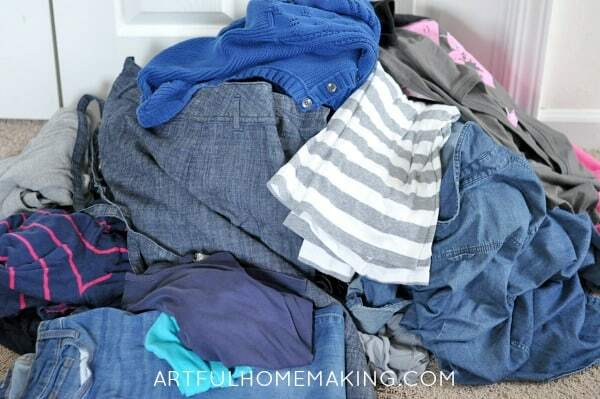 KonMari tells you to take everything out of your closet and drawers (and anywhere else clothing is stored) and make a huge pile on the floor. This was part of my pile when I was just getting started. You’re supposed to hold each item in your hands to determine if it “sparks joy” or not. I didn’t do this with every single item, because there were some things I knew I wouldn’t be getting rid of because I either a.) already knew I loved that particular piece of clothing, or, b.) couldn’t get rid of it because it was necessary and couldn’t be replaced immediately. As I mentioned in my previous KonMari post, I had to keep several things that don’t really spark joy, but eventually I’ll try to replace them as I’m able. My husband’s clothing is on the right side of the closet, and you can see I have hooks behind my clothes to hang necklaces on. It’s not ideal (because they’re kind of hard to reach), but we don’t have a lot of space. 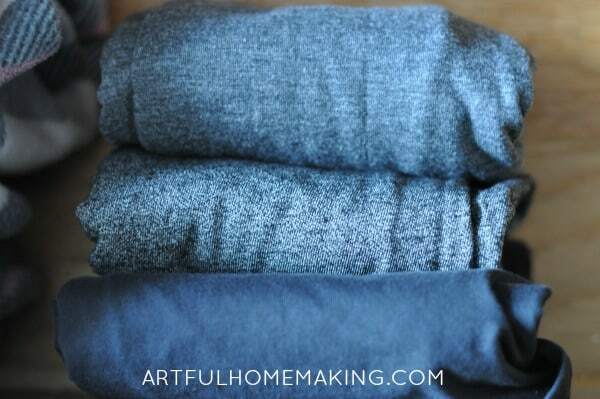 Folding this way may look like a lot of trouble, but it’s really not hard. I will admit that it does take longer than just dropping something in a drawer. And that’s pretty much how we do my boys’ clothes. 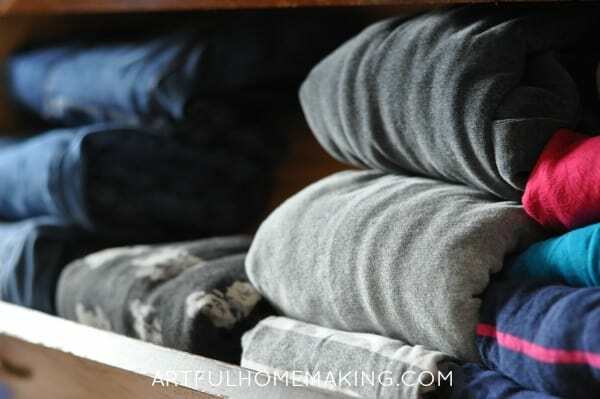 They have cubes (with fabric drawers) that we put their clothes in, and I know they would never keep them folded like this. So I basically just do this for my own drawers. When I have time. There are times when it doesn’t make sense to fold everything in a time-consuming way. If you’re a more visual person, here’s a youtube video showing how to fold shirts the KonMari way. And here’s a video of her folding other items. I don’t know what it is, but when I open a draw that looks like this, I feel a huge sense of satisfaction. Now I just need to go through the kids’ clothes. Well, just the boys’ clothes. The girls do their own. And the boys don’t care, so I do theirs. 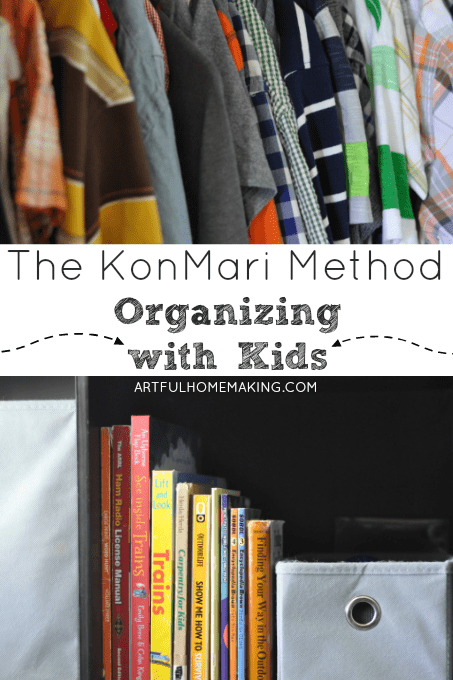 One thing I found lacking in the KonMari books is practical help for children’s clothing. And I don’t really need any help there anyway, so I guess it’s okay. I just go through the boys’ clothing, see if it fits and if it’s still wearable or if it can be passed down. Then I store the off-season clothes and I have a box for my youngest to grow into, and that’s it. So, I don’t use this method for our children’s clothes. My primary difficulty with their clothing is just making the time to stay current with it! Regardless, KonMari really has changed the way I think about organization! 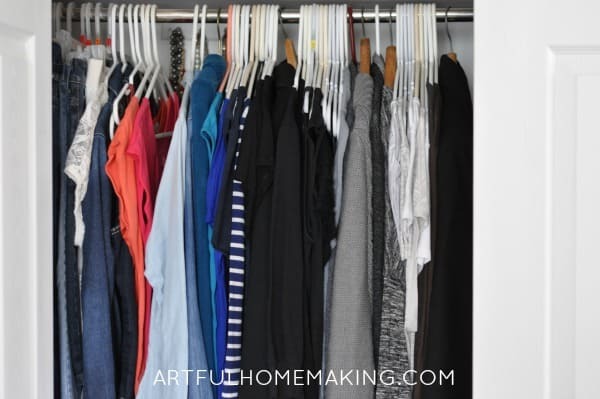 Her ideas about organizing clothing are a great way to finally love everything in your closet! 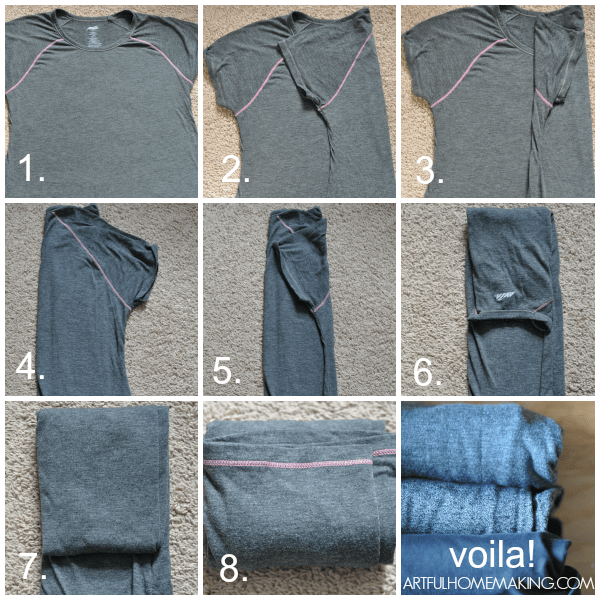 Have you organized your clothing using this method? Or do you have a method you would recommend? I need to do this, get rid of things that don't spark joy, thank you so much for sharing! It's fun! Thanks so much for stopping by! 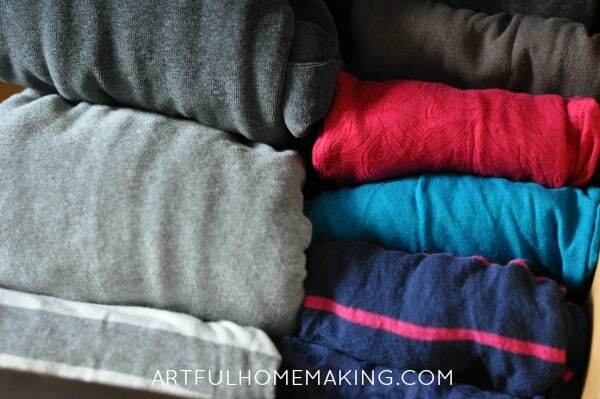 I might have to try folding this way; I roll my clothes right now and most are in hanging shelves. I skimmed through the first book a few months ago and it did help to inspire some purging, but I am looking forward to seeing what the 2nd book says.